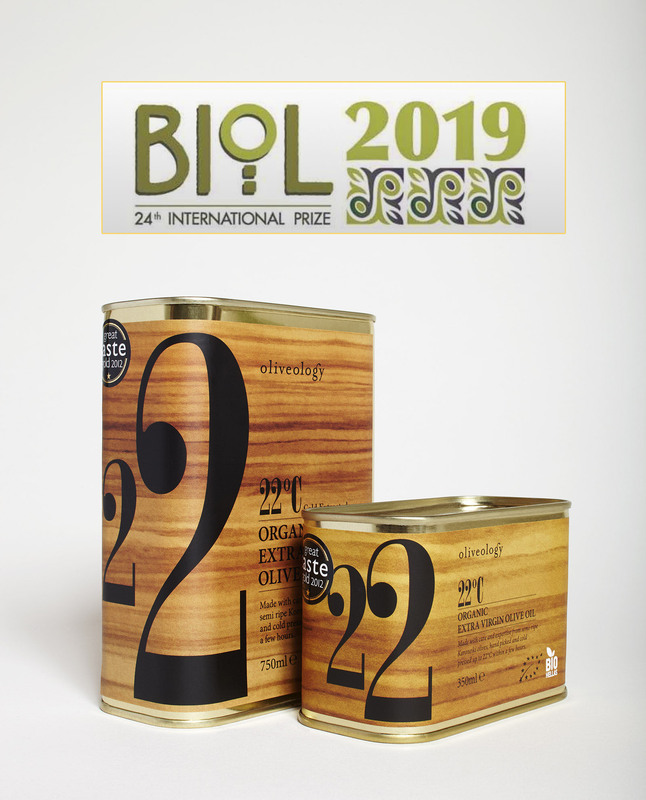 Our new season 22C evoo has just been awarded with a SILVER medal in the BIOL Prize 2019 – International Prize for The best Organic Extra virgin Olive Oil in the World. The olive oils were judged on their chemical analysis results and as well as their organoleptic characteristics. This international organic olive oil competition took place in Bari, Italy in March 2019. We are extremely happy that for another year one of our oils was selected amongst hundreds of olive oil samples from around the world. This was a fantastic achievement for our harvest 2018/19 as we had to face some of the most challenging weather conditions in the lat 50 years. This week is one of our favourites of the year! Why, you ask. This week we are receiving our new olive oil! We are very excited and soon you will get the chance to stock up on your favourite ones. We usually use our 22 olive oil in our recipes. This mid harvest olive oil is made from semi ripe olives. It has a mellow quality and a silky smooth texture that adds depth and flavour to all of our culinary preparations. But for this week’s recipe, we’ve prepared a dressing using our lemongrass and tarragon olive oil. This awarded olive oil is made from semi ripe olives crushed with fresh lemongrass and tarragon. We’ve used it in the past in this wonderful summer salad. As we received the new batch, an idea came to mind. 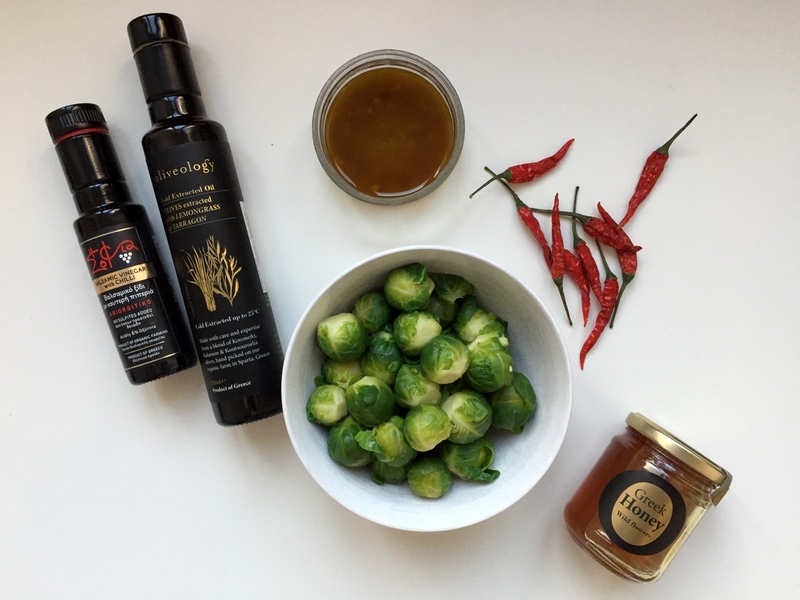 This olive oil pairs perfectly with our sweet balsamic chilli vinegar. Our organic vinegar from the Agioritiko red grape variety has a gentle kick from chilli peppers that is the ultimate pair for the very fresh flavour and intense aromas of our lemongrass and tarragon oil. You can use this dressing in your salads, fish, prawns or green vegetables. We had frozen some Brussels sprouts a few months back and, on a this cold spring week, we’ve decided to combine a winter vegetable with a vibrant dressing. Hint: it’s great with asparagus that are now in season! Mince the garlic using salt. In a bowl, whisk the garlic, vinegar, chillies, honey until well mixed. Slowly add the olive oil, whisking constantly until emulsified. Toss the dressing in warm vegetables, or poor over your favourite dish. Happy new olive oil season everyone! Spring is officially here! The weather is warmer, the sun is shining and the flowers have blossomed. Spring for us at Oliveology is often the time for new beginnings. Try something new. Start something new. Plant a seed that will soon blossom into something beautiful. 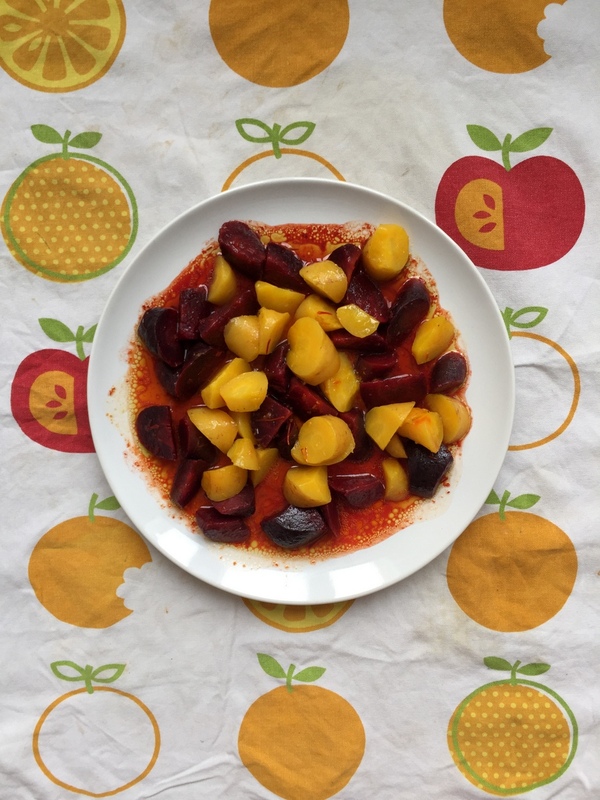 For us, it is also often about discovering new, seasonal ingredients or techniques. This week we are cooking with fresh artichokes. You have, of course, the option of using our marinated artichoke hearts. But in the spirit of trying something new, we suggest you get your hands on the fresh ones. Remember our artichokes with anchovy vinaigrette from a few years back? Delicious! And how about some Greek classics? Lida, our resident chef, had prepared this traditional recipe for you a few years back. Artichoke hears with peas, carrots and potatoes. Absolutely delicious! In our Vegan Cooking Class at the end of April, she will be making this recipe again, also showing you how to prepare fresh artichokes. As above, in the spirit of trying new things, book yourself a space – we’ve got very few left! Inspired by spring, this week we have for you a recipe of artichokes cooked in white wine with wild garlic, capers and lemon olives. A perfect dish to have as a main or as a meze sitting under the sun. Place the olive oil in a pot and over high heat. Place the artichoke hearts facing down and fry, until the edges are brown and charred, about 2-3 minutes. Lower the heat to medium and season with the smoked salt and pepper. Add the fresh garlic, two cups of white wine, and one cup of water. Cook for 30 minutes covered and 15 minutes uncovered, until the artichokes are soft and the remaining liquid has formed a thick sauce. In the last 5 minutes of cooking, add the olives and capers. Serve with crusty bread and some Assyrtiko wine. 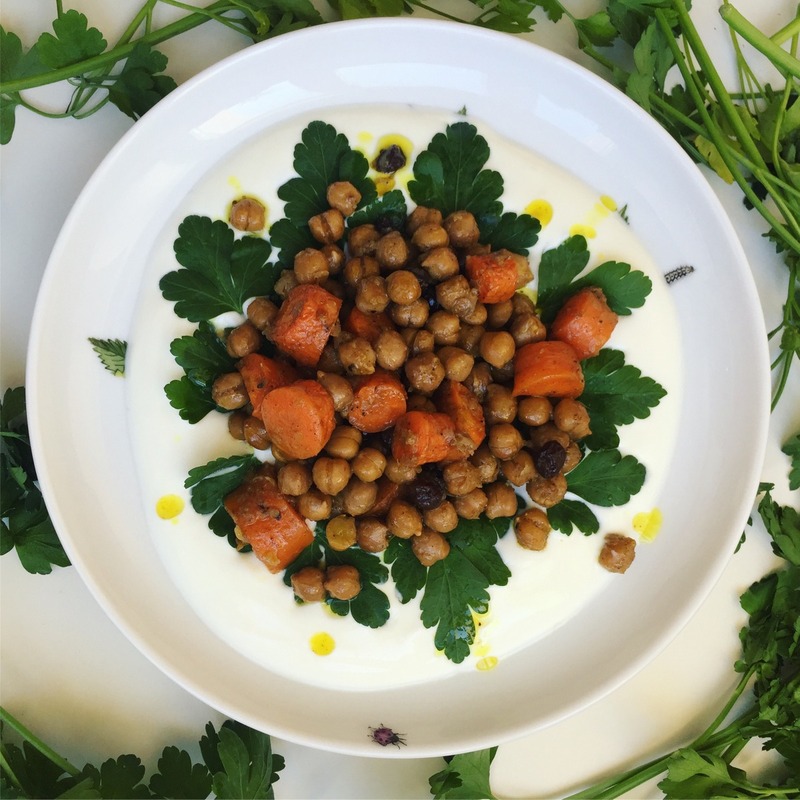 This week we’ve got another exciting recipe with chickpeas for you. Chickpeas are one of our go-to pulses for all seasons. They work perfectly used in a spiced winter stew, or turned into a fresh summer salad. So this week, as we are well into Lent, we have prepared this vegetarian dish that is perfect for those of us fasting. This recipe is quite interesting, as we’ve decided to use honey and raisins to add sweetness to the chickpeas. We spiced it up with curry spices and served it with plenty of Greek yogurt to balance it (of course, you can omit this if you are fasting). And turns out, this dish makes for a wonderful, hearty breakfast, I kid you not. And did we say that it is super easy to make? The night before soak your chickpeas in plenty of water. The morning after cook them until tender. Cut your carrots into small bite-sized pieces. In a baking tray add the chickpeas, carrots, olive oil, spices, raisins, water and honey. Mix very well. Bake, covered at 200C for 20 minutes and uncovered for another 20 minutes, until all ingredients have happily come together and you have a thick stew. Serve hot or at room temperature, with plenty of yogurt and fresh herbs. This week, we’ve got a very luscious, spring recipe for you. We are using one of our favourite ingredients, artichoke hearts! 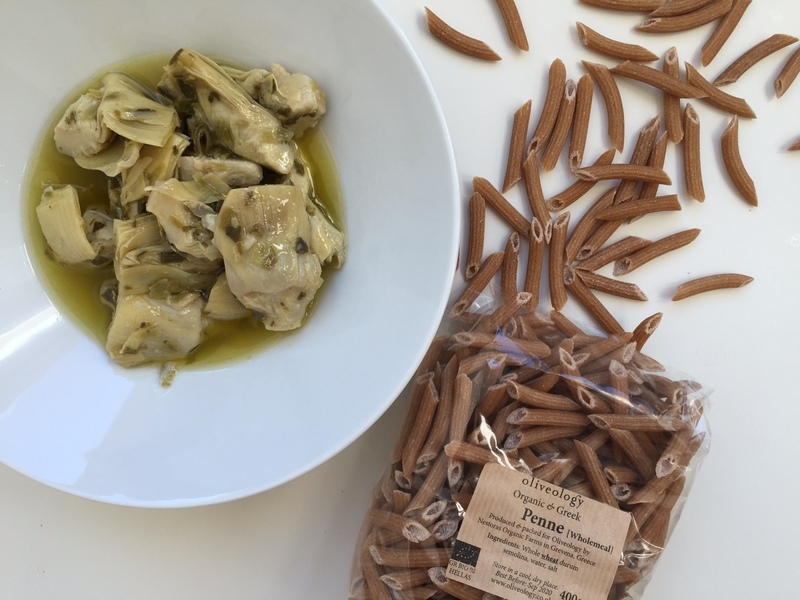 Our marinated artichoke hearts come from the area of Kyparissia in Peloponnese. They are picked, cleaned and placed in glass jars with leeks, olive oil and sunflower oil. They are an ideal addition to your tarts, or as part of an antipasti dish. Inspired by the much loved artichoke-spinach combination, this recipe is perfect for a cosy dinner for those days when the sun refuses to shine, and we still feel that we are more in winter than in spring. So what are we making? Oven baked wholemeal penne with spinach, artichokes, creamy Greek yogurt and galomyzithra cheese-all baked in the oven. And as always, it is really easy to make! If you love artichokes as much as I do, then have a look at our Vegan Cooking Workshop in April, where you will learn how to prepare and cook fresh artichokes! Finely chop the leek and place in a large bowl. Drain the artichokes, reserving the oil and add to the bowl. In a non-stick frying pan, gently heat up the spinach, until just wilted. You should be left with one cup. Add to the bowl. In a separate bowl, mix the artichoke oil, galomuzithra and yogurt. Add the garlic. Mix well, adding 3/4 cup of water to dilute. You are to have a thin, creamy sauce. Worry not, the pasta will absorb it. In an oven-proof casserole dish, place the vegetables, creamy sauce and pasta and toss everything together. Sprinkle some graviera cheese and bake at 180C for 40 minutes, or until the pasta is cooked and the cheese has melted. Last week we were very happy to have the wonderful Margot, from Margot’s Kitchen hosting one of our workshops. During two fully booked classes, Margot talked about the Mediterranean diet, healthy eating and offered clever tips on how to incorporate more wholesome ingredients into our daily diets. 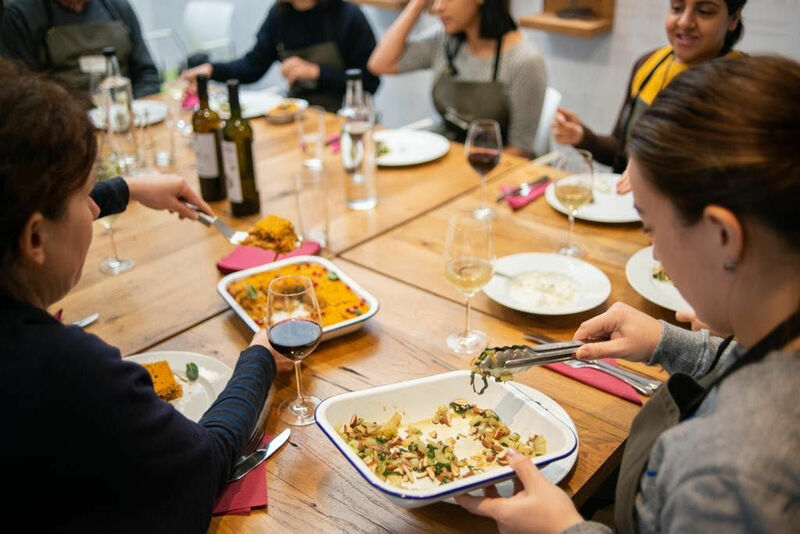 The workshop, as with all of our workshops was vegetarian and included delicious recipes such as a Butternut Squash Kibbeh with Chickpeas & Caramelised Onions and a gluten-free Banana and Pistachio Teff Cake. So, this week, we have one of Margot’s recipes for you, made especially with our favourite Oliveology ingredients. This Roasted Antipasti recipe is very easy to make, and will definitely impress your guests! We’ve got more cooking classes coming up this spring and summer, so watch this space or email us to make a booking! 1. Preheat oven to 180C (160C fan). 2. 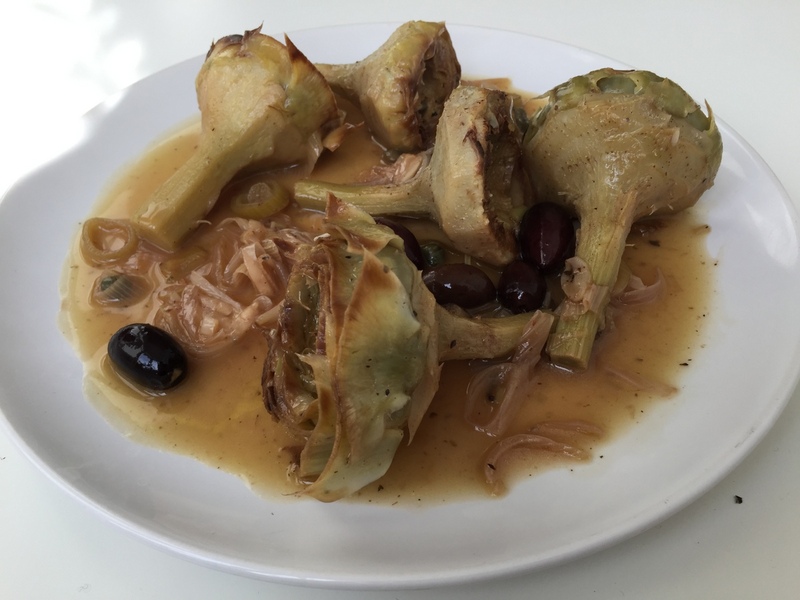 In a medium-sized tray, place the mixed olives along with the roasted peppers and artichokes. 3. Add the sliced lemon and fresh herbs. 4. Toss with the extra-virgin olive oil and roast for about 30 minutes, stirring occasionally. 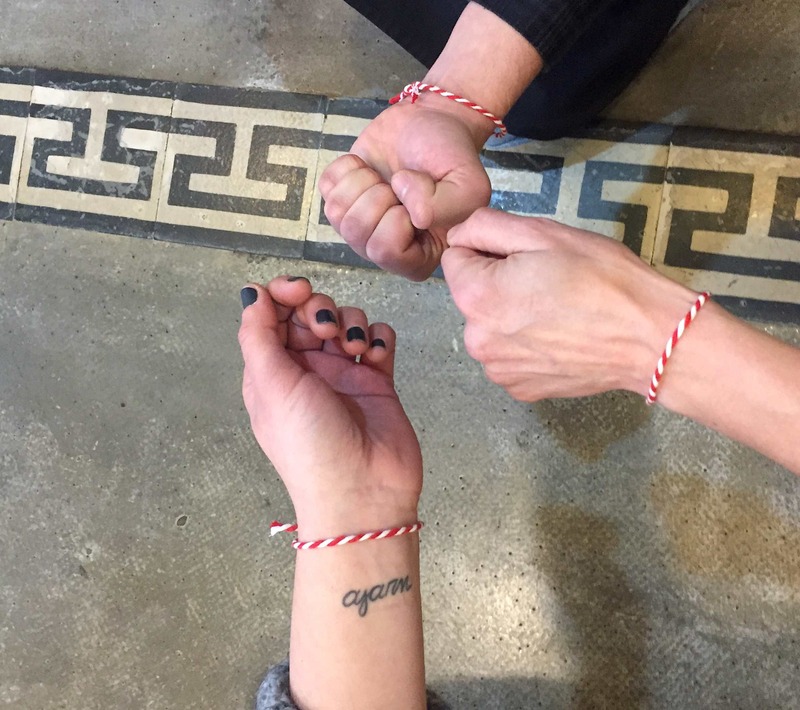 When I was a kid, every year there was a day when my mum would come to me and my little sister and give us a thin bracelet, made of red and white strings. This is ‘Martis’ (lirerally meaning March), she would say. And with that care in her voice that only mothers carry, she would add: And you should wear it, so that the sun doesn’t burn you. As a kid, I wasn’t exactly sure how the Martis would protect me from the sun, but in my mind, this day only meant one thing: the beginning of spring, my favourite season. I knew that while wearing it, the days would get longer, the sun would shine brighter and some of my favourite foods (strawberries!) would start to appear at the markets. Martis is part of folk tradition in Greece and the Balkans, going back for decades. The phrase my mother would use (I learned as an adult), is associated with the often unexpected changes in spring weather, a reminder that one needs to be careful this month. Its colours, red and white carry various symbolisms in different cultures across the region. The ritual of removing it is equally important in Greek tradition. Folk tales say how one has to remove it at the end of March, and hang it on a tree, so that swallows then collect it and use it to create their nests. Another tradition calls for the Martis to be removed at Easter, and to be tied on the leg of the lamb that is being cooked, burning over the open fire. As an adult, I rarely bothered to actually take two pieces of string and create my own. So when a few years ago, working at our shop at Borough Market, Marianna came and gave us all a Martis, I was presently surprised. And immediately transported back to my childhood, remembering my excitement about spring. We used to make this with my grandmother, Marianna told me. We would sit across from each other with long white and red strings and twist them tightly. Then we would cut it in pieces and give to the whole family. Unlike me, Marianna has been wearing the Martis every year. And every year, she gets it for all of us at Oliveology. So this March, join us at Oliveology, in sharing your childhood memories around Martis and celebrate the beginning of spring that is finally here. This is a recipe unlike any others. What do we mean? Well, this is a recipe that you can make at home, when your fridge is empty. You know, those evenings when you are too tired or too lazy to go shopping, or those days that you have forgotten to do so -it has happened to us as well! The secret here is a nicely stocked cupboard and a bit of imagination. Have a look at our bundles, get yourselves some essential cupboard items and we’ve got you sorted. So this week, we are making lentils. We are not smoking them, but we are using two of our ingredients that will offer some smokey-ness. Smoked salt and roasted red peppers! This recipe will be amazing with some freshly squeezed lemon juice and zest, but as this is a recipe to make with an empty fridge, we are using our lemon olives instead! And of course, our chilli vinegar for some spice and kick. Freshly cut herbs and / or caramelised onions would also work, you know, just in case you do decide to go shopping! But the recipe words perfectly as is, using just your cupboard staples. In a large pot with water, add the smoked salt and lentils. Boil until the lentils tender. Drain and place in a large bowl. In the meantime, cut your peppers in fine strips. 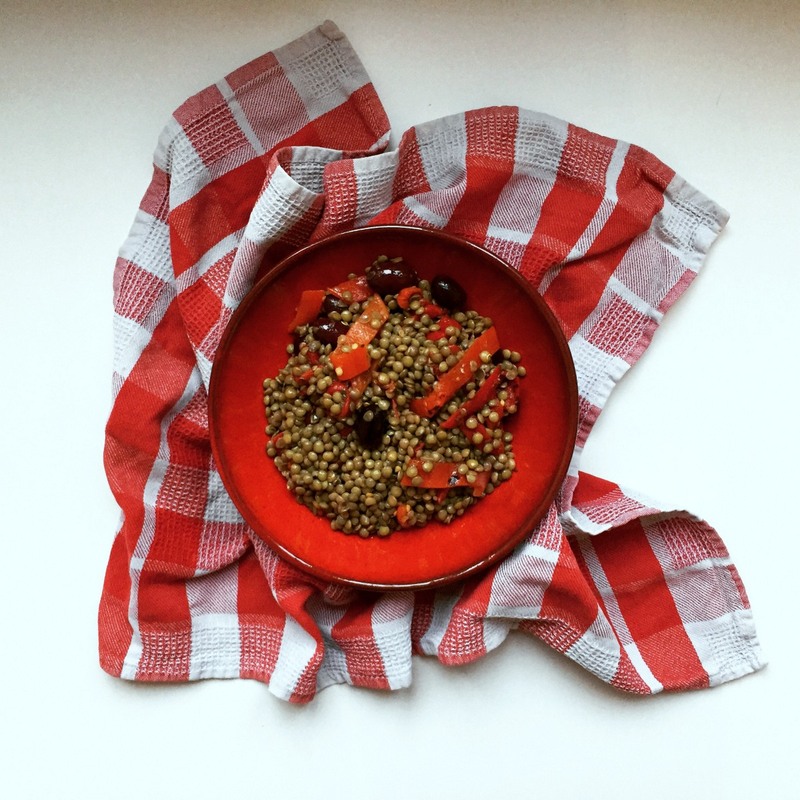 Place the peppers in the bowl with the lentils. Add the olives, dried oregano, olive oil and vinegar. Toss everything together and add more salt if needed. Add herbs and caramelised onions (if using). Serve hot or at room temperature. Valentine’s Day on February 14th is usually associated with romantic love. For us here at Oliveology it is indeed a day of love. Love is not only for lovers, but also for friends, family, yourself. It is also the day to indulge in the pleasures of eating-and cooking for that matter. So this week we have prepared a recipe for you, using one of our very special ingredients! Black. Truffle. Sauce. Our truffle sauce is made of champignon mushrooms, blended with black summer truffle, extra virgin olive oil, salt and spices. Each jar contains 10% of truffle, so the aroma is quite intense. You can use this sauce in various dishes, stir into warm pasta, add on omelettes or mix with cream for a delicious sauce. My personal favourite is simply spreading it on warm toast, with fresh herbs on top. Add a poached egg and you’ve got yourselves the most luxurious breakfast -or dinner for that matter! But back to this week’s recipe. It is possibly the simplest way to use this delicious ingredient. Apart from simply spreading on toast, that is. 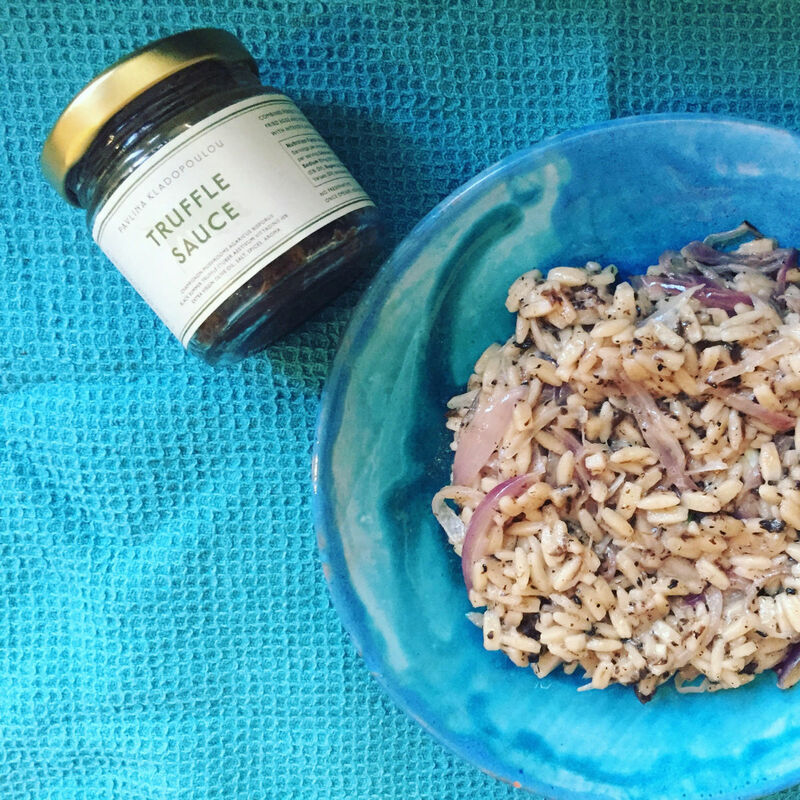 You can swap orzo for rice, and if you want to complicate it a bit more, use vegetable stock instead of water. But for us, this version is ideal. Finely slice the onion. In a medium sized dish and over medium-high heat gently fry the onion in the olive oil until translucent and slightly caramelised. Add the orzo and stir until covered in the remaining oil and well mixed. Add half of the truffle sauce and stir again. Add the 300ml of water, season with salt and pepper and let it cook, half covered until orzo is al dente. Remove from the heat, add the cheese and stir, adding a few splashes of water if needed. Serve with the remaining black truffle sauce and fresh thyme.